EQUIPMENT w CHEMICALS w MOLD GONE w CONTACT US w WATER/FIRE w DEHUMIDIFIERS w WEB SPECIALS ? There is probably no subject that has received more attention in the restoration industry in the past year than that of mold and the health effects of mold exposure. This topic has not just been isolated to the restoration arena. There have been some very high profile cases that have received national media attention. Mold-related problems have also caught the attention of many in the legal community who are beginning to view mold as "the next asbestos." It is of utmost importance that every contractor coming in contact with structures contaminated with mold not only understand the proper procedures and techniques used in remediation, but also the techniques used to avoid contaminating the structure further by releasing additional mold spores. This is critical in protecting their employees from the potential health effects of mold and their businesses from the possible cost effects of litigation. Three terms that continually arise in discussions and in protocols for mold remediation are: "containment", "negative air", and "air changes per hour". These different terms are all interrelated and all involve the use of air scrubbers or negative air machines. This paper will attempt to describe and define each of these terms and how they relate to a typical mold remediation job. Containment is the process of isolating a contaminated area from the rest of the facility. This is nothing new. For years, restoration contractors have used common sense and hung a piece of poly or a tarp over a doorway to prevent the spread of contaminants from one area to another. Today the process is a little more sophisticated, but the end goal is the same - to prevent the contaminants from spreading. Negative pressure can be described as a partial vacuum and can be demonstrated with the use of a straw. Sucking on one end of a straw creates a negative pressure zone inside the straw. Air flows into the opposite end of the straw due to the negative pressure inside the straw. This pressure differential is maintained as long as more air is removed from the straw than can be replaced. Containment areas under negative pressure behave in the same way, as lower pressure inside the containment pulls outside air in and prevents the contaminated air from escaping. There are basically two types of containment: source containment and full area containment. Severity of the mold growth and the size of the contaminated area will generally dictate which type should be used. When the contaminated area is small and easy to dispose of without causing further contamination, simple source containment may be an option. Negative pressure is generally not used during this type of operation. Removing a moldy ceiling tile and sealing it in a plastic bag is a good example of a source containment application. This method should only be used when there is no chance that any appreciable number of mold spores will be released while the contaminated object is being removed and bagged. 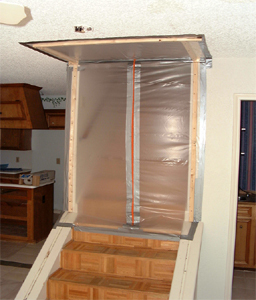 Source containment can also be used with localized negative pressure if a very small area with mold must be removed. A one-square foot patch of mold on a wall would be an example. A small piece of poly can be taped around the area to be removed. A small HEPA vacuum can be used for this purpose by inserting the inlet nozzle inside this small containment to create a negative pressure and to vacuum up released particles. Full containment is used when the contaminated area is larger or requires some invasive activities to remove the mold source. In full containment the entire containment area must be kept under negative pressure at all times during the mold abatement process to prevent the escape of any air that could potentially contaminate other parts of the facility. An example of this type of containment would be the removal of mold-contaminated wallboard. If the contaminated area is small, an enclosure of polyethylene sheeting is typically constructed that is large enough to completely cover the work area and to accommodate a worker. The poly can be taped, glued or tacked to the wall area around the portion that is being removed to form one side of the containment. Adjustable poles or similar devices can be used to form the other three sides. When the structure is complete it should look like a large shower or a tent made of poly, with a double flap door to allow entry without losing negative pressure. If the structure is built properly, it will be almost airtight around the perimeter and will allow make up air to enter through the door opening. If the contaminated area is larger a full-scale containment area must be erected. Poly is applied to cover all the walls, floor, and ceiling of the area under containment. It may be necessary to also construct airlocks, pass throughs, and equipment rooms, depending on the work that must be done and the equipment required. Full containment always requires that negative pressure be maintained inside of the containment area. The purpose of the negative pressure is to ensure that any directional air movement is from the clean air environment into the contained area, and not the other way around. This ensures that contaminated air from inside the containment will not flow out through doors, openings, cracks, etc. into the clean area. Negative pressure in containment is typically achieved using some type of air moving equipment. For many years restoration contractors have used fans for this purpose. If a fan is placed in a window and other doors and windows are closed negative pressure will be created inside the room. Air will stream into the room from the space under the door and other small openings. Since contaminants will not flow against this air stream the fan is acting as a simple negative air machine. Today's contractor uses negative air machines or even more sophisticated portable air scrubbers to accomplish what the fan accomplishes in the above example and more. These machines contain high output blowers designed to move large quantities of air. They also contain multi-stage filtration systems to trap the contaminated particles that are being pulled into the unit by the blower. Negative Air Machines and Portable Air Scrubbers: What's the Difference? The terms negative air machine and portable air scrubber are sometimes used interchangeably since they can both be used to achieve a negative pressure inside of a containment area. However, there are some significant differences between the design and capabilities of the two types of equipment. In essence, all portable air scrubbers are negative air machines but all negative air machines are not portable air scrubbers. Negative air machines were developed in the early 1980s for the asbestos abatement industry. They are designed to HEPA filter large volumes of air and generally used in larger commercial and industrial facilities that are typically unoccupied. These machines are left on a jobsite for a lengthy period of time, so not much concern is given to their size, weight, or ease of transport. Consequently, they are basically large, heavy boxes on four hard casters that move a lot of air and require at least two people to carry. Portable air scrubbers (PAS) were introduced by Abatement Technologies, Inc. in the early to mid 1990s for a wide variety of facility restoration applications. These devices were specifically developed to provide a much more lightweight, portable and maneuverable alternative to negative air machines. A true portable air scrubber can be transported to the job site by one person and can fit through much tighter spaces than a negative air machine without damaging the customer's facility or property. For those reasons, portable air scrubbers usually have an upright design. Features like built-in stair climbers with non-marking belts and transportation dollies with non-marking wheels are standard on many PAS. Properly designed PAS also utilize special fans that have the capacity to pull high volumes of air through dirty filters to maintain sufficient airflow and negative pressure. This makes them especially useful in mold abatement applications where a great deal of airborne debris can be created during the remediation process. Variable speed controls are especially useful on smaller projects where exhausting too much airflow from the containment could cause the poly walls to be pulled away from the containment frame. This feature is particularly important since a large number of mold remediation projects require small containments. The single speed negative air machines simply cannot be used on many of the smaller containments without taking the risk of collapsing the containment. Operating hour meters on PAS's are also useful for tracking operating hours for filter changes and for billing purposes. There are two ways that a negative air machine or air scrubber can be used to create negative air pressure. If the containment is large enough, the machine can be placed inside the containment and a flexible exhaust air hose (flex duct) can be run from the outlet of the machine to an area outside of the containment. In some instances, space restrictions or other reasons may necessitate that the machine be left outside of the containment. In these installations the flex duct is attached to the inlet of the machine and used to draw air out of the containment. How Much Airflow Will You Need? Most specifications for containment areas require that a pressure differential of .02" of water column be maintained between the containment area and the surrounding area to achieve the necessary negative pressure. It is a good practice to use a pressure monitor to constantly monitor the pressure differential. This gauge should be viewed regularly during the containment and the results recorded in the event questions about the integrity of the containment are broached at a future date. There are too many variables to establish a fixed formula to determine how many negative air machines or PAS would be needed to maintain the .02" on a given job. The integrity of the seals around the containment and the size and type of door openings are two important issues that affect the pressure differential. Obviously, huge openings for the air to enter the containment will require a significant amount of air to be exhausted to maintain a negative pressure. Conversely, if there is little air entering the containment, less air is required to be exhausted. A room with very poor poly installation and large holes in the poly may require multiple negative air machines to maintain a .02" differential whereas with better seals and well-built doors one machine may suffice. Some contractors use a visual test to estimate if their containment has good negative pressure. When the negative air machines are operating, the walls of the containment should be sucked in slightly. If they are not, chances are there is not an adequate pressure. If they are bowed in significantly and look like they are going to be pulled off the wall, there is most likely too much pressure and either more air should be let in or less air should be exhausted. This visual test is not a substitute for a pressure monitor, but it can provide a way to evaluate the integrity of the containment at all times and from any location. Other contractors use smoke tubes to periodically test for directional airflow. One important aspect that must be considered during the planning of any containment is the effect of filter loading on the airflow of the negative air machine or air scrubber. During many mold remediation projects significant amount of debris can become airborne. As filters become loaded with debris airflow can quickly drop by 50% or more from the "clean filter" airflow, especially in machines equipped with forward-curved "squirrel cage" blowers. If this loss of airflow is not accounted for in the planning process, it is very possible that negative pressure could be lost. The third term that is used in protocol for mold remediation projects is "air changes per hour", or ACH. ACH measure the rate at which fresh air is replacing contaminated air within containment. ACH refer to how many times per hour an amount of air equal to the total volume of air in the contained space is exhausted and replaced with clean air from outside containment. Most mold remediation projects call for four air changes per hour. Some professionals recommend designing the system for six ACH to provide an extra cushion for filter loading and other variables. To determine air changes per hour it is necessary to know the size of the containment area and the actual output of the negative air machine or scrubber. Example: Room size is 50' by 50' with a 10' ceiling. 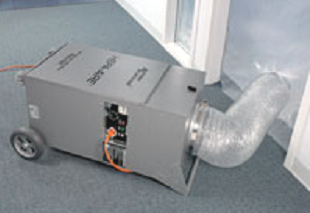 Negative air machine is rated at 2000 cfm (cubic feet per minute). The 4.8 changes per hour would exceed the 4 changes per hour specification. However, if the filters were allowed to get too dirty and the airflow was reduced to 1200 cfm, one machine would not provide the necessary air changes. (1,200 cfm x 60 = 72,000 cf per hour; 72,000/ 25,000 = 2.9 air changes per hour.) This is where air scrubbers have a distinct performance advantage over negative air machines since they are designed to withstand much more filter loading while maintaining high airflows. It is very possible on some jobs that one air scrubber can be used where it would require multiple negative air machines. Containment, negative air, and air changes per hour are terms that will continue to grow in use as the mold abatement industry grows. The well-educated contractor will be very familiar with them and will know how they are applied in this exciting new industry segment.